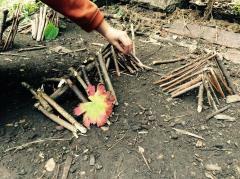 Join us for our Forest School at Abney Park this May Half Term. Abney Park is a beautiful nature reserve in the heart of Stoke Newington. With veteran trees and an abundance of wildlife, it is a wonderful setting for our Forest School. We will explore the wonders of the forest, build dens, go on nature walks, make natural art and craft, play some fun woodland games, plus a lot more. The sessions are for children aged 8-13 years. The cost is £40 per day per child or £150 for all four days. To book, please email us on info@inthesticks.org.uk with dates, your phone number and your child’s name. Please bring a packed lunch and wear warm, waterproof clothes and shoes.